DC NearlyWeds: Long Time, No See! Hello, kids. I know, I know. I've been gone for so long, you don't even remember me. I don't even remember me! For those of you who do, you know it's been a long road for me. My fiance and I have been engaged for over a year, and now? Now we're less than a hundred days from our wedding. It's been... a journey, to say the least. I have to say that, for me, wedding planning has not just been about planning a wedding; I've learned a lot. I've learned a lot about myself, about us, about what's important, and how there are so many little things I never thought I would have to worry about! But here we are! We are 96 days away from the big day! I guess it would be safe to say that Miss Old Town would be a better name for me. We're having a local wedding in Alexandria, Virgnia in Old Town. At first I was a bit sad about how my name is no longer an accurate reflection of our wedding, but then I realized it is indicative of how things can change. So over the next week, I'm going to catch you guys up. It's been a lot of ups and downs, but now everything is coming together. I'm nervous. I'm excited. I'm a bride. I finally feel like a bride. I don't think I felt like that before now. I want to share that with you guys. With that, I'll share something I did over the weekend. First of all, our wedding colors are navy blue, green, ivory, and gold accents. (More on that tomorrow!) After a lovely lunch at the Chart House on the Waterfront at Old Town with a fabulous friend (there is something about going to lunch with one of your favorite girlfriends and, in this case, their awesome friend), we trekked over to The Enchanted Florist on South Fairfax Street. 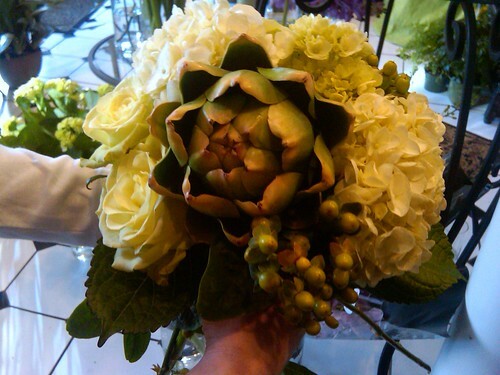 I wanted to pick out my bouquet! I knew I wanted something different, but in classic colors. I went with an ivory and green palette. I was a bit nervous. I wanted to stay away from things that some consider to be bridal staples: orchids, peonies, garden roses, etc. I wanted succulents. I wanted striking. I wanted something that was a bit out of the ordinary. ...which will go great with my dress. Which isn't ivory. Or white. Or champagne. Or anything remotely close to any of those colors. But that's a post for later. Either way, I'm excited. The look is different, but it works. Are there any ways you plan on making your look different? How about your flowers? It's great to be back, ladies. I'm so excited to be here writing again. Your post hit home with me, a bride also planning a fall wedding, but anticipating a lot of changes (even to that one decision we have made). I love that you've reminded us how important flexibility is, because that's so true! Your wedding sounds amazing -- I love the bouquet, it's tre unique and I can't wait to hear about the journey you've taken this past year!! welcome back! that should be a gorgeous bouquet, nice choices. Old Town will be a beautiful place for a wedding - can't wait to hear more about your plans.